Look at our new section dedicated to wine and culinary guided tours in Milan and Lombardy and book your guided visit. Discover Leonardo's Last Supper, the masterpiece of Leonardo da Vinci. With About Milan you can book your visit to Leonardo's Cenacolo (Last Supper). Online the new section dedicated to the Universal Exposition of Milan 2015. Are you searching for information about the city of Venice, the "city of water"? Now is finally online Aboutvenice.org, your tourist guide to Venice. Find all information about: history, culture, city sightseeing, maps...and much more. Over Milaan, uw gids in Milaan: dear Dutch friends, we have just uploaded About Milan translation in Dutch for you! Take a look at it: Milaan toeristen gids! About Milan announces a new collaboration with PlacesOnLine.com, a tourism and vacations portal specialized since years in offering guides to places and countries all around the world. Come back to visit our site in the next weeks and you will find many new features such as: videos, travel journals / diary, postcards etc. Dear Visitors, welcome to aboutmilan.com This website is a non-commercial project, offering many useful informations about the city of Milan, italian capital of fashion, design and contemporary art. Aboutmilan.com is your Tourist Guide for the city of Milan – the italian city leader in the industrial sector, famous for his fashion and design showrooms. 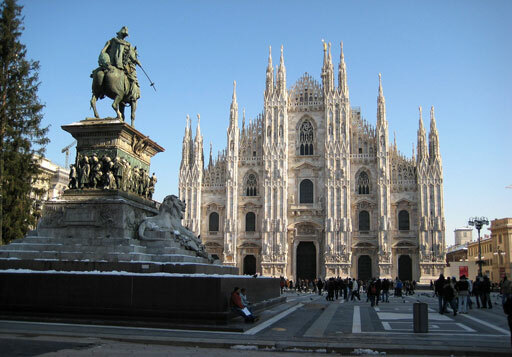 We'll introduce you to the history of Milan, his art and culture, his monuments and museums. In this site you could find information about where to sleep in Milan, where to shop, where to take the famous 'aperitivo milanese', where to enjoy the Milan nightlife, or when to rent a bike to visit the city. Additional you can find useful information about tourist offices, transportation in Milan , address or numbers for the emergencies, or the address of your consulate. You will appreciate the pages with the weather (with always updated Forecast Conditions), the cost of living, the quality of life. If you are a football fan you would appreciate the part dedicated to the international famous football team Inter & Milan, and to the division in the city of Milan between the supporters club. In aboutmilan.com you could find a photo gallery, useful maps and addresses and suggestions to enjoy your time in Milan. You will find information about: Culture, Events, Museums, Traditional Wines and Food, Shopping and the study of foreign language.